And it was an action of the good feet of Theodoulos. 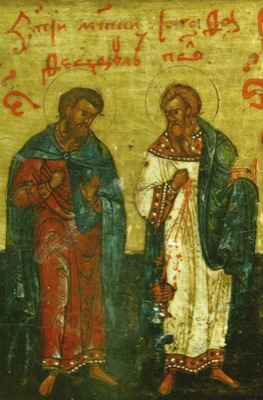 The Holy Martyrs Agathopodas the Deacon and Theodoulos the Reader lived in Thessaloniki during the reigns of Emperor Diocletian (284-305) and Maximian (284-305). 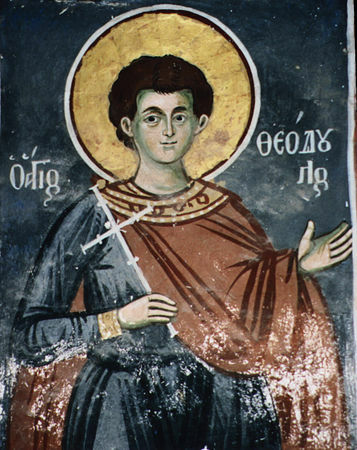 Deacon Agathopodas was very old, and Reader Theodoulos very young. Both distinguished themselves by a venerable life and piety. 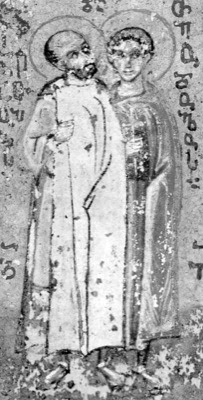 Once, Theodoulos had a vision in his sleep, in which an unknown person in radiant garb placed some object in his hand. When he awoke, he saw in his hand a beautiful ring with the image of the Cross and he realized that this was a sign of his engagement to Christ the Bridegroom and future martyrdom. By the power of the Cross depicted on the ring, the Saint healed many of the sick and converted pagans to faith in Christ the Savior. When the emperor Diocletian issued an edict of a persecution against Christians (303), many attempted to hide themselves from pursuit, but Saints Agathopodas and Theodoulos fearlessly continued to proclaim the Gospel. Governor Faustinus of Thessaloniki heard of this, and gave orders to bring them to him for trial. Seeing the youth and excellence of Theodoulos, Faustinus attempted flattery to persuade him to renounce Christianity and to offer sacrifice. Theodoulos replied that he had long ago renounced error and that he pitied Faustinus, who by embracing paganism had condemned himself to eternal death. The governor offered the Martyr a choice: the fortunes of life, or immediate death. The Saint said that he would certainly choose life, but life eternal, and that he did not fear death. When Faustinus saw that he would not persuade Theodoulos, he began to talk with Agathopodas. The governor attempted to deceive him and said that Theodoulos had already agreed to offer sacrifice to the gods. But Agathopodas did not believe this. He was convinced that Theodoulos was prepared to offer his life for the Lord Jesus Christ. Not having any success, Faustinus ordered the Martyrs to be taken to prison. The holy Martyrs prayed fervently and boldly preached the word of God to the imprisoned, so that many were converted to Christianity. Eutinios, the head of the prison, reported this to the governor. Then Faustinus halted the execution and again locked up the Martyrs in prison. There the holy Martyrs prayed fervently and both had the same dream. They were sailing in a ship, which was in danger of being wrecked in a storm. The waves cast them up on shore, arrayed in radiant white clothing. The Saints told each other about the vision, and they gave thanks to God for their impending martyrdom. In the morning, when the Martyrs were again brought to Faustinus, they declared to him: “We are Christians and we are prepared to undergo any suffering for Christ.” Faustinus gave orders to cast them into the sea. 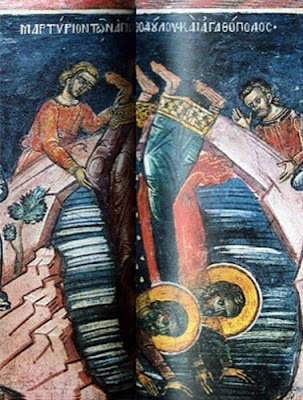 The waves carried Saint Agathopodas to the rocks, and he loudly exclaimed, “This shall be for us a second Baptism, which will wash away our sins, and we shall come to Christ in purity.” Saint Theodoulos was also cast into the sea. The bodies of the Saints were washed up on shore. They were dressed in radiant garb, but the ropes and stones used to weight them down were gone. Christians took their holy bodies and gave them reverent burial.